Most sauces that I grew up with involved either tomatoes for pasta and pizza or a brown gravy that had something to do with roast beef or pork. High school home economics classes always taught beginner cooks the ins and outs of white and butter/cream sauces. If we were lucky, we had an occasional treat of chocolate sauce that was poured over ice cream...but, that was about it. I did not learn about fruit sauces until I was quite grown up. In the modern era in which we now live, almost anything can be made into some kind of sauce thanks, in part, to the invention of blenders and super blenders like the Vita Mix machines. Today's sauce recipe is a simple variation of pie filling...but as the saying goes...less is more! This blueberry sauce recipe is not thick and gloppy like some pie filling; it is more tasty and berry-flavored than any of the commercial products and takes little effort. 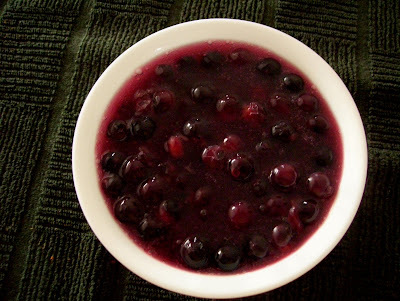 You will enjoy this blueberry sauce served hot, warm or cool...it is delightful and very easy to make. Combine dry ingredients in a small saucepan, mixing well; gradually add water, stirring well. Cook over low heat, stirring constantly, until thickened and bubbly. Add blueberries. Cook, stirring occasionally, 5 minutes. Serve warm over ice cream, desssert waffles, mousse cake (post #82), or crepes.